So, I finally gave in to this damn cold. I've struggled through this week at work with an annoying cold (sore throat, blocked nose, main-lining Lemsip) but enough is enough. I'm sitting at home on the sofa today, catching up on the wonderful Talk Ultra (twitter) podcast by Ian Corless. Thinking about weight in my last post, I wanted to take a closer look at the last few years. Firstly, I'm not weight-obsessed, and I've never had a weight-related illness (in case you're concerned I'm dwelling on the topic in an unhealthy manner). I am however far more informed and observant than I have ever been previously in my life. Part of this is thanks to Mrs who successfully lost a lot of weight earlier in her life and has kept it off - it'll be 7 years in May, she's done an amazing job. She was far more tuned in to food, weight, and general health and general wellbeing than I was. I thought a useful past time this morning was to sit for a while and see if I could see where the major directional changes were, and why. The orange line is logged data (and it's always been from the same pair of scales), and the black lines are interpolated. If I was away for a weekend and measured 90.0kg on Friday, and then 90.3kg on Monday, I'd add in 90.1kg and 90.2kg for Saturday and Sunday. I never tried to weigh myself on anything other than my home bathroom scales. If they're poorly calibrated, I'll at least assume they are consistently offset each day. When Mrs swapped from her old analogue scales to my digital ones, she had a discontinuity due to differences in calibration. The overall trend over the 54 months is downward, but there are some serious ups in there too! The following graphs span 12 months on the X-axis and 15kg on the Y-axis. This means the angle of the trend line (the rate at which my weight was changing) can be compared from year to year. Only a couple of months of data for 2008. The thing I can't believe is that I started at virtually 100kg (15st 10.5lb) - and I'd been heavier in the past, during my fairly unhappy days in Scotland. At this point I was taking a lead from Mrs, all about low fa and calorie restrictions. It worked well - I was clearly ready to ditch the pizza and shed a few pounds. This period from October to December is one of the most rapid weight loss periods in the whole 5 years. 2009: Can you spot my honeymoon? I got married in April we spent a few weeks in California on honeymoon - that added a few kg! The second half of the year shows a gradual and sustained decline (Right! We're married! Let's not get old and fat!) - with one or two exceptions. At the start of November I went to a work conference in the US and came back a week later and 4kg heavier! It falls off quickly, but it's worth noting that sudden increases never come decrease at the same rate. 2010: The only way is up! Looking at the years in isolation, 2010 is the "worst" (making the bold assumption that a downward trend is "best" and is desired). There was a lot of being out and boozing during this period - my team at work was expanding rapidly, and "team building" was very high on the agenda. We raced quite a lot in 2011, but not with any serious or structured training. At the end of the year, start of November, we went on holiday. That was bound to cost a few kg! Trend was down over the period. What's interesting is that almost never is there a period without a gradual trend up or down - not just in this year but in any year. I'd think it would be fascinating to see a graph of my weight since I was born. This is one of the most interesting years. I came into 2012 with my first ever triathlon coach, and an objective to compete in Ironman 70.3 UK and Ironman Wales. My training was the most consistent it's ever been in my life (it's actually the only year I've ever done anything that would count as structured training). Jan to June were perfect. I was getting leaner, faster, stronger. I hardly drank any alcohol during this period. I believed alcohol was a main inhibitor to previous weight management, and it would affect my training. The odd effect though, was that as soon as my big races started towards the end of June, I steadily gained weight all summer and throughout all the other races. In retrospect the focus and limitations I'd put myself under for the first part of the year were simply unsustainable. I hadn't got the right balance. I also had a blow-out after each big race, and never quite recovered afterwards. You can see this by the upward spike in black (interpolated data from while I was away racing), followed by an immediate not-quite-recover in orange when I got back home. I'm pretty sure I still don't know what my "racing weight" is, I don't think I've ever reached it! The end of the year, starting about a third into November, was when I went Low Carb High Fat (LCHF). My weight fell off a cliff. December is the longest sustained period I've spent under 80kg - 25 days. The trend breaks at Christmas with a spike back to 80kg - yesterdays graph map that directly with my carb intake increasing above my target max of 50g/day. 2013: When LCHF becomes HCHF! I mentioned in my slightly cathartic last post that I'd lost control a bit (a lot) on the weight front. Let's look at that a bit more closely. Last year when I moved to LCHF (Low Carb High Fat) eating I lost a lot of weight (around 6kg) rather dramatically - this is expected and is very well recorded. 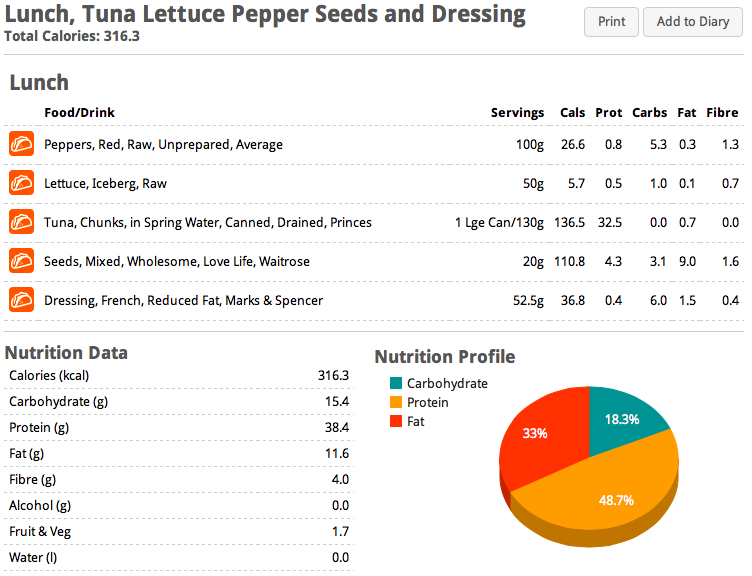 Absolute carb intake against weight for Nov & Dec 2012 - Christmas is where it started to break! I was logging everything I ate and drank. I was keeping relatively close to my self-assigned target macro nutrient profile of 75% calories from fat, 20% from protein, and 5% from carbohydrate (note that there isn't an absolute calorie target - this isn't a "calorie counting" plan). The decline continued until just after Christmas. I decided I needed a break from hyper-focus on logging every mouthful (I was taking a general break from being quite so analytical about food, training, exercise), and reckoned I was settled in enough to LCHF to "freewheel" (after all, they say you can eat as much as you like, right?). 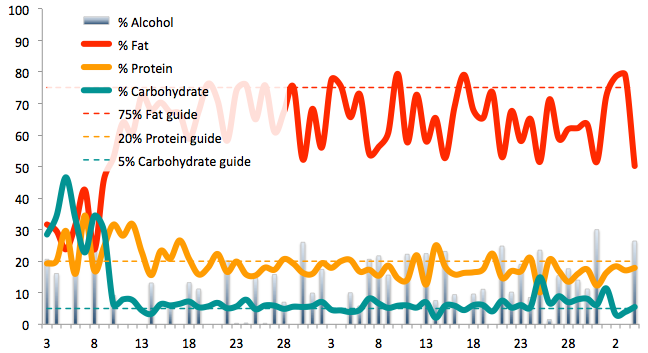 There's also a well recorded phenomenon of weight gain on an LCHF diet plan if you over-ride (accidentally, or on purpose) you satiety signals. That is, you (continue to) over-eat. The reason you can "eat as much as you like" and not need to calorie count on LCHF is because the high caloric density foods give you a good clear "I've eaten enough" signal at the right time, and you listen to it. It is possible to ignore that signal. I think I do, mainly unconsciously but occasionally as a result of a bad decision - particularly on the few days I've committed wilful "carbicide" courtesy of Dominos (and the fastest way to gain weight is the worst of all worlds, high fat, high carb, high protein, high calories - way too much of everything!). My weight whilst "Freewheeling" from Jan to mid April 2013 - Argh! Stop climbing! It's nothing to do with exercise - I was actually getting marginally more exercise into Q1 2013 than I was at the end of 2012, but was gaining weight. Why? The macro split isn't too bad - there are just way more calories than I was accounting for. Compare that with what my previous low fat, high protein diet used to give me. A typical lunch from last year - it's no wonder I was on 4-6 additional snacks per day! The problem was that I was augmenting these meals with occasional other (high fat) snacks, and - importantly - a full cooked dinner (all be it still on the LCHF theme). Over the last few weeks I lost a lot of control and was enjoying a nice big slice of cake from the coffee shop with my coffee at work, and even caught myself making a couple of slices of toast with peanut butter at work (it was lovely, but I felt terrible afterwards). High everything. During this fortnight I was feeling more and more ill in my stomach, like there was a toxic buildup. I didn't feel actively sick apart from once or twice, and there weren't any problems with, er, "waste", I just felt terrible. Bloated, laden, heavy (feeling heavy as well as being heavier). I felt like the handbag on the constipation commercial where the troubled lady just keeps on ramming food in (I had a brief look for it on the YouTubes but I don't want to end up being followed around by constipation ads so I stopped). I also don't think it's any coincidence that I have had a sore throat and heavy cold over the last week, the first trace of illness I've had since going LCHF in November (and I always have a cold at Christmas/New Year). I certainly made the right call last Saturday to restore some greater awareness. My first day of logging again. On my first day of logging I hardly ate anything compared to recent weeks. Ignore the "-61" in red - that's a hangover from last year where I had WLR set on a daily calorie target deficit of 500 calories under that which I should need to maintain my weight. Looking at calories only is a flawed approach, but you can't ignore them all together. That's what I've learned this year. A real eye opener as to how little I needed to eat to reach these numbers. And Saturday I felt much better, and the day after that, better still (apart from the cold, which I'm only really just shaking off now). I'll stay on alert for a couple of weeks and see what happens to the weight graph. Since Saturday (5 days) it's already dropped by 1.3kg. I'm astounded I shot up to 86.7kg, almost around 9kg heavier than my minimum before Christmas - that was only three and a half months ago! So, since I hit the reset button on Saturday I've felt much better. And you know what? I've been more productive at work, my brain is quicker and more useful, and I'm feeling positive - hmm, just the feelings I discussed the first time I went LCHF. No coincidence. Look after yourself, eat well - you are what you eat. 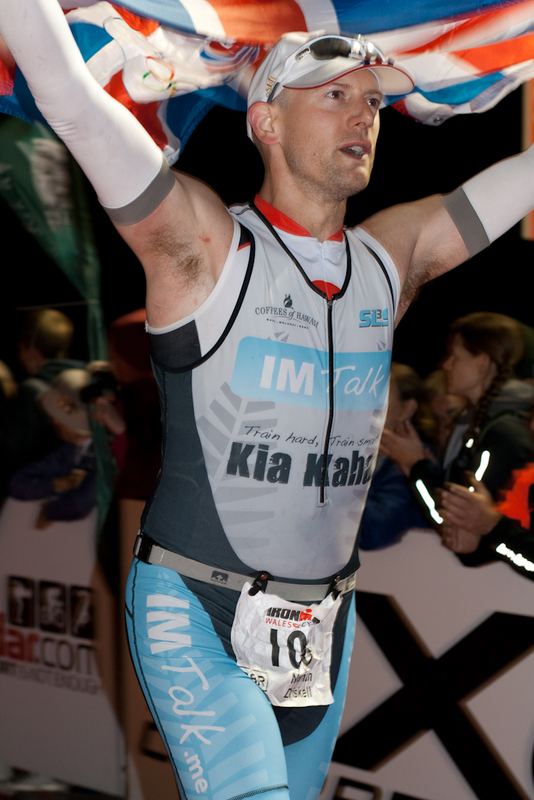 This blog was about my quest to become an ironman. Well the votes are in and the results are out: I made it. Wimbleball, Bolton, Galway, Tenby - all finished, and I've got the incredibly rare Ironman Ultimate Finisher glassware to show for it. At some point after Tenby I got a bit too wrapped up in entering more events, and wanting to go faster and further. I went balls-out on the Royal Parks Half Marathon and got myself a bout of ITBS to show for it. That wasn't fun, and it still isn't. I haven't run since November. I thought cycling was fine, so I got excited about cycling and put my efforts into completing a turbo-trainer mega-set over Christmas. Turns out cycling brought on ITBS too, so no more cycling either. Rolling into 2013 the races I wanted to do and in some cases had already entered are ticking past without me in them. The first Hell of The Ashdown (last year's report) I've missed in 4 years, The London Ultra (Mrs ran it, she had an amazing day, and so did parkrun extraodinaire abradypus - I cheered them on), Thames Turbo Race 1 (Mrs raced it she had a good day - I marshalled and cheered, good fun). Next up is Thames Turbo Race 2, I won't be in that either. I was signed up for Coach Joe Beer's tri-camp at Club La Santa in Lanzarote. I went there at the end of January with a month of pain-free knee. Lanzarote was great - incredible place, if a bit windy. I had already paid to take my bike out, so I took it. I cycled a bit too much, and on the morning of the last day the pain came back. I did absolutely nothing for 2 weeks afterwards, then got back onto my exercises (as scheduled by Mountain Man Rob Turner). I've been sticking vaguely to my rehab exercises since then - probably not as well as I should though. I went Low Carb High Fat from mid-November, I saw great results up until Christmas with everything positive - the weight fell off and I got lower than I've ever been before. As I got more unhappy and rolled into 2013 I totally broke it. I made a string of very poor nutrition decisions, including stopping logging my intake entirely since the start of February. I thought I had everything in check and could freewheel. I couldn't. Recently I've put on weight at an astonishing weight due to continuing poor meal decisions. I've broken my adaptation to being a fat-burning athlete, I've eaten cake, pizza, toast - all of which now leave me with a horrible bloated stomach and a real toxic stomach ache as I'm just not used to processing carbs in such volumes lately. I've totally over-consumed alcohol, and I commented when I started this journey over a year ago that I have a problem with that. I have stopped working with my coach (thanks Joe, you were great), and I'm not going to South Africa for Unogwaja or Comrades (I got accepted, I got excited, then ultimately declined - though not because of this injury). Terrible clip-art, shamelessly stolen. I'm not proud. The only person that can turn this around is me. So I am. 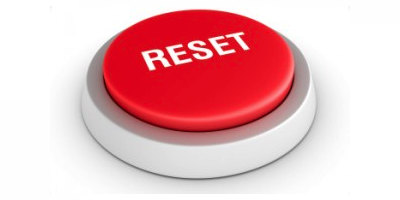 It's time to man-up, take control, and hit the reset button. There it is, above. You can hit it too if you feel you could use a symbolic action. The positives are that I am getting stronger. I can now cycle-commute twice per week as long as it's not on consecutive days, and I don't get any pain. If I carry on improving I could start running slowly and minimal duration as early as the end of April. I have an aim to run Wimbledon Common parkrun on my birthday - that would be a significant moment. I really miss parkrun. I'm going to remove those races from the countdown on the front page (apart form the couple I'm still signed up for). I'm going to freshen up the colour scheme a bit. I did consider just not blogging any more (I achieved the point of the blog after all), but I think there are more races and adventures to come. I'm going to celebrate the success of last year - without feeling the need to go bigger and bolder this year.